Untreated silica gel was used as the stationary phase for a simple and cost-effective prepurification of 5-carboxypyranoanthocyanins from red wine enriched by the addition of pyruvic acid. The composition of the fractions obtained was analyzed by ultra-performance liquid chromatography–tandem mass spectrometry (UPLC/MS2) and the results enabled the changes in 5-carboxypyranoanthocyanin profile during preparative separation to be described and explained. Repeated purification on silica gel followed by reversed-phase separation enabled the isolation of 5-carboxypyranomalvidin-3-glucoside in high purity and represents a cheap and robust alternative to the commonly used procedures. 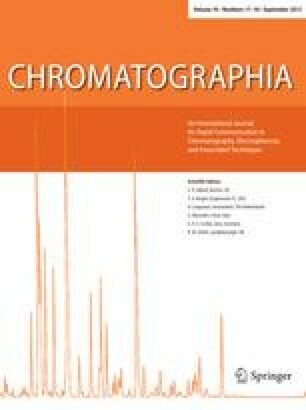 Reversed-phase preparative chromatography with an isocratic elution [15 % acetonitrile in water (v/v)] provided sufficient resolution, showing that the addition of an acid is not necessary in anthocyanin separation. The antioxidant capacity of 5-carboxypyranomalvidin-3-glucoside was compared with malvidin-3-glucoside and a group of common polyphenols (e.g., gallic acid, quercetin, rutin, and catechin). The financial support by projects no. P206/10/0625 and P301/11/0662 from the Czech Science Foundation, project no. CZ.1.05/2.1.00/03.0058 of the Ministry of Education, Youth and Sports of the Czech Republic, Operational Program Research Development for Innovations—European Regional Development Fund, and grant from Palacky University no. PrF_2013_020 is gratefully acknowledged.